Many thanks to David, son of John McFarland for passing on the following record of his trip to New Zealand at the end of last year. 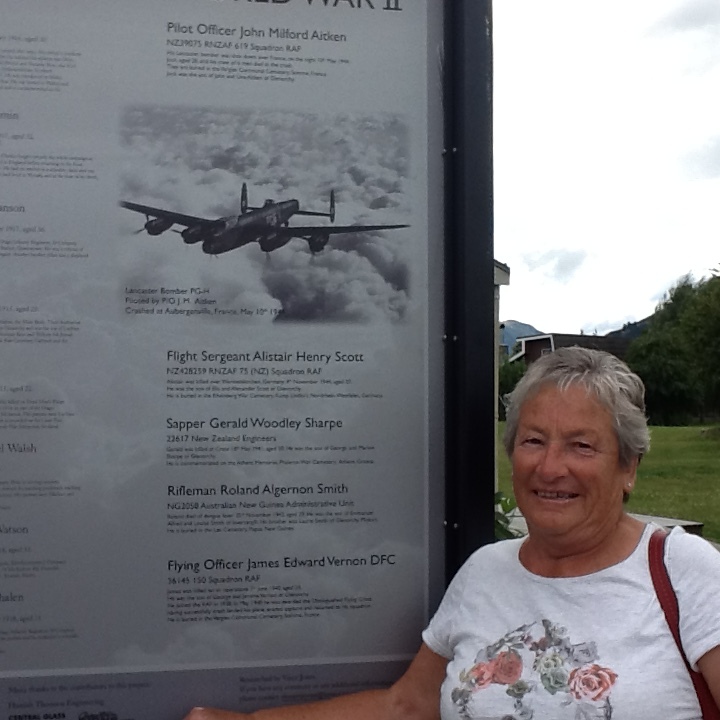 David and his family went out to meet up with relatives of the airmen that his Father flew with in 75(NZ) Squadron RAF. The crew were posted to the Squadron in February 1944, flying their first op on the 11th February, and after conversion to Lancasters took part in the first 75 operation with Lancasters, bombing mashalling yards in Paris on 9th April. 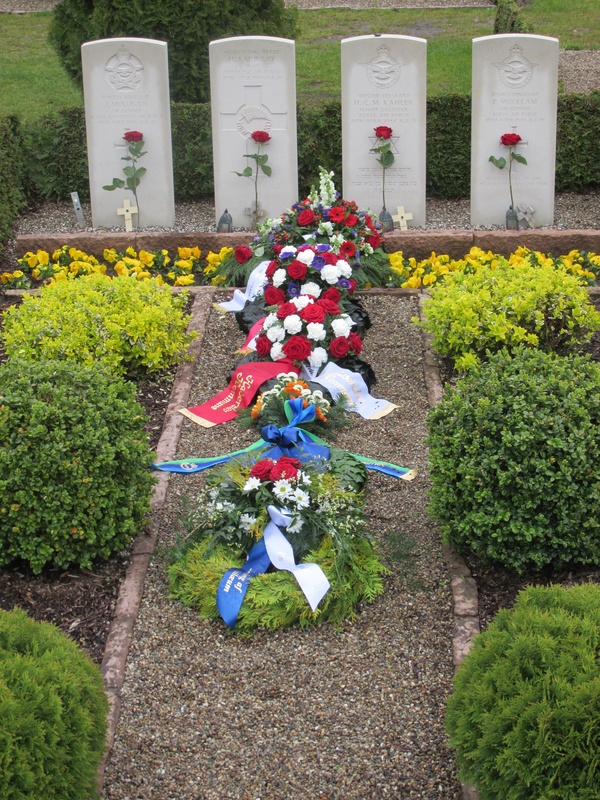 Four of the crew are buried at Gram, Denmark – James Murray RNZAF (Pilot), Haymen Kahler RAFVR (Flight Engineer) Jack Mulligan RCAF and Peter Woolham RAFVR (Air Gunners). Gordon Irwin RNZAF (Wireless Operator) John ‘Paddy’ McFarland RAFVR (Navigator) and Douglas Hill RNZAF (Air Bomber) became Prisoners or War. 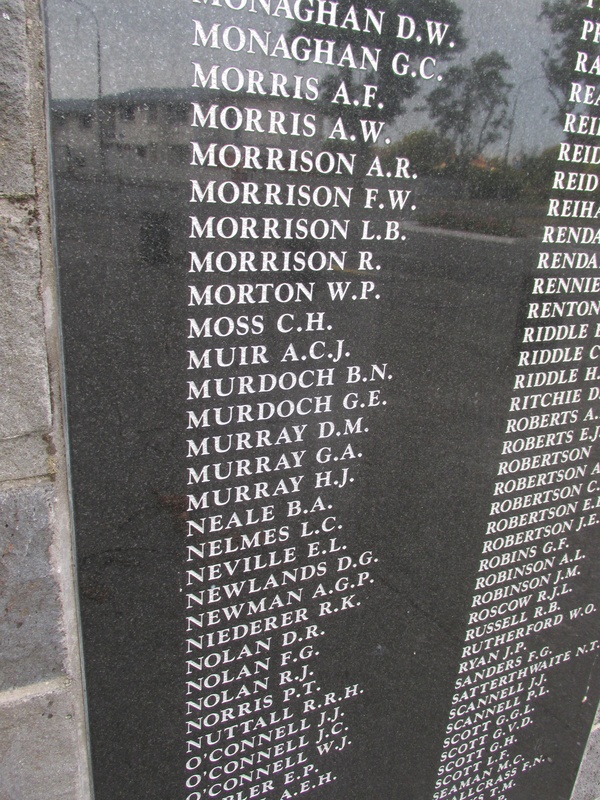 The pilot James, “Jim”, Murray was from Pleasant Point near Timaru on South Island. 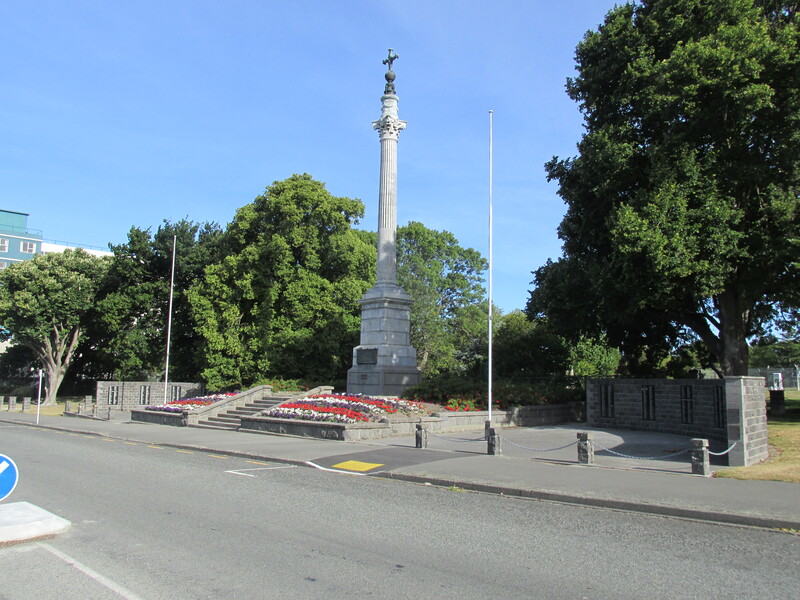 His sister, and three brothers all joined the New Zealand forces, with four serving overseas. 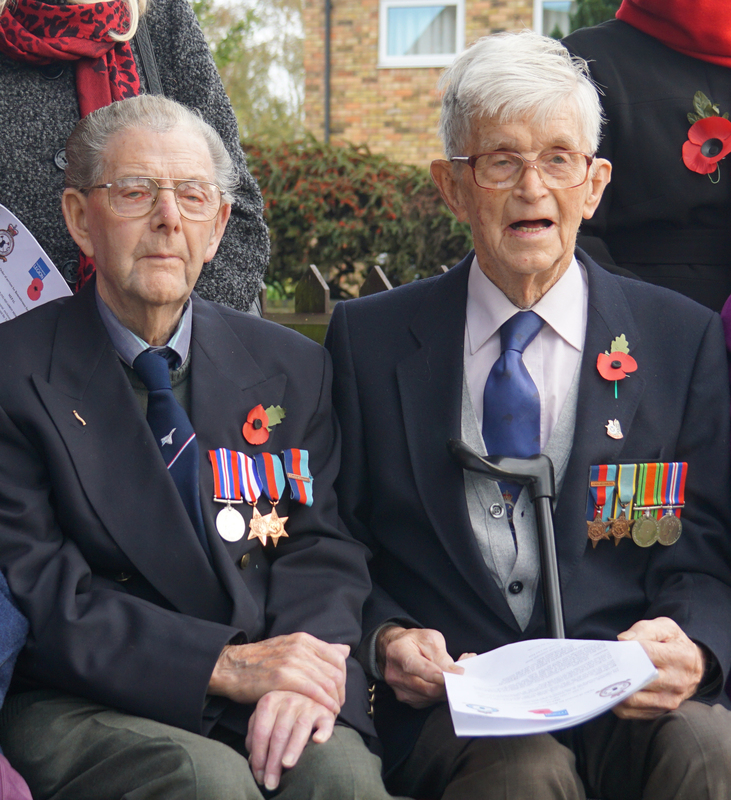 Sadly two brothers died, one in Crete in 1941 and the other at El Alamein in 1942. After Jim’s death, the fourth and youngest son, then stationed in New Zealand, was not permitted to serve overseas and was discharged from military service to pervent a further loss to the Murray family. 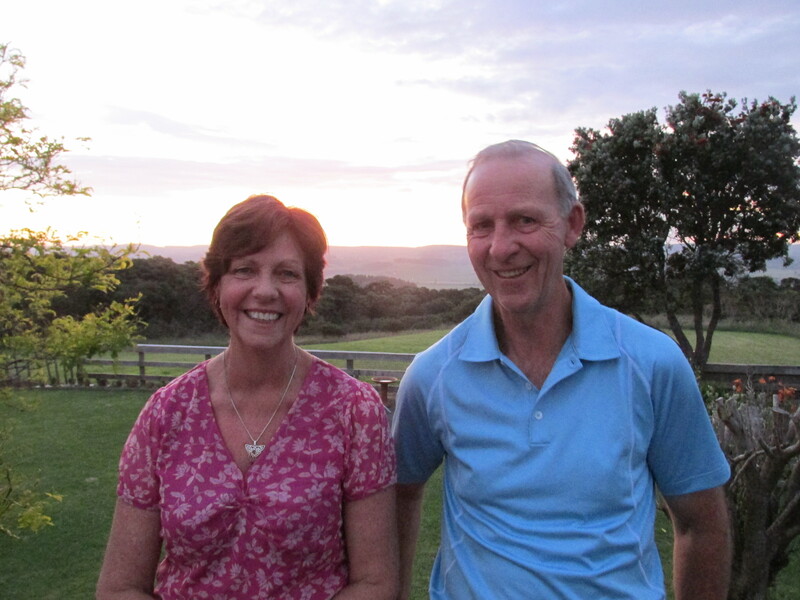 We had the pleasure of meeting his daughter Alice, and her husband Mike Constantine, who live in Timaru. 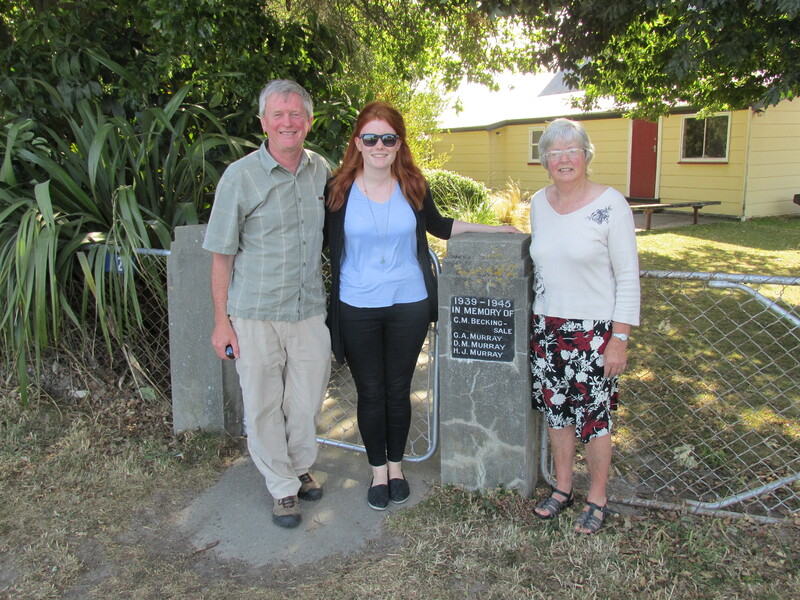 (from left) Paddy’s son and granddaughter – David and Emily and Alice Constantine at the Memorial stone at Rosewill Junior School, Pleasant Point. 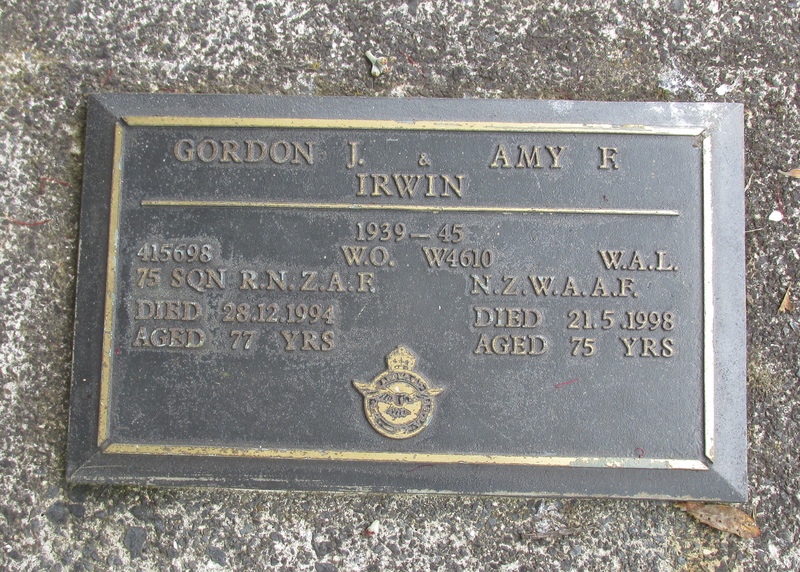 Gordon Irwin returned to New Zealand after the war and married Amy, who had served as a WAAF, stationed in New Zealand. He initially resumed the family farming business but later was a green-keeper at several golf courses on the North Island. He died on 28th December 1994 aged 77 years. 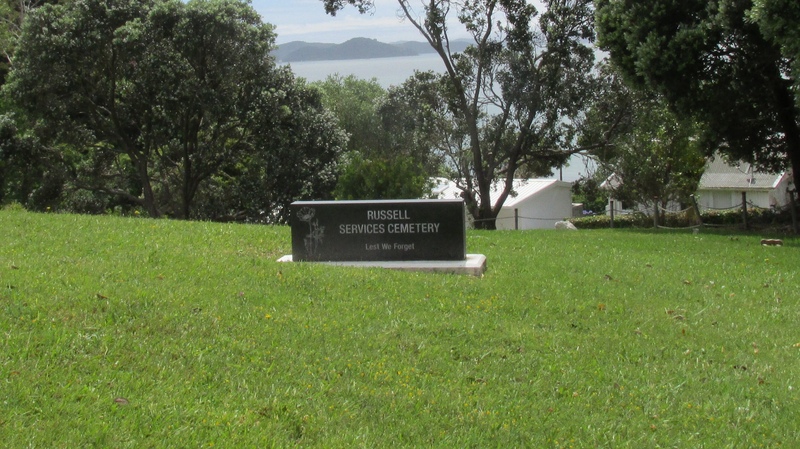 He is buried, with his wife, at Russell Services Cemetery – a beautiful tranquil spot overlooking the Bay of Islands. 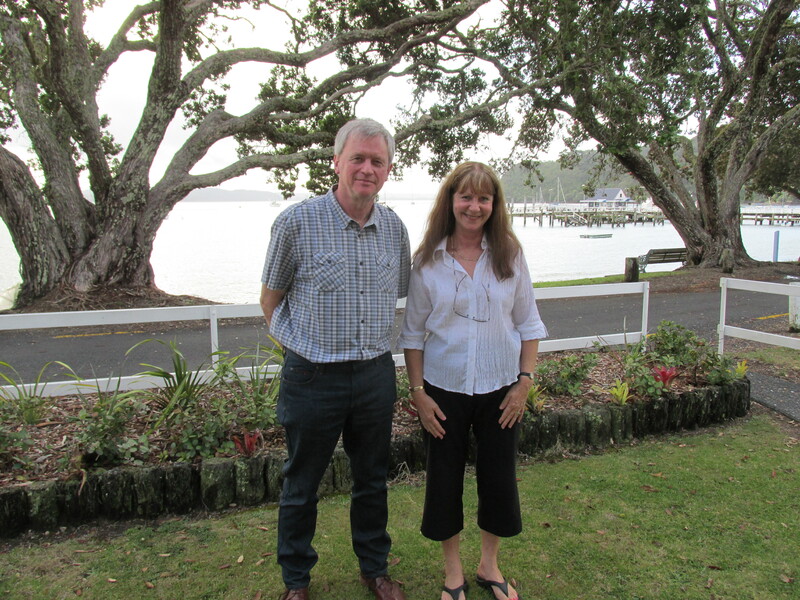 We had the pleasure of meeting his daughter Kathy Wright who lives in Russell, and were the guests of Marg Collins his other daughter at her home at Helensville, north of Auckland. There we enjoyed a splendid meal in the company of her husband and her son and daughter in law, and with Ron Irwin, her brother and his wife. Gordon and Paddy were particularly close as Gordon’s father had lived in Ulster before emigrating to New Zealand. Gordon had enjoyed several leave trips to Ireland in the early months of 1944. 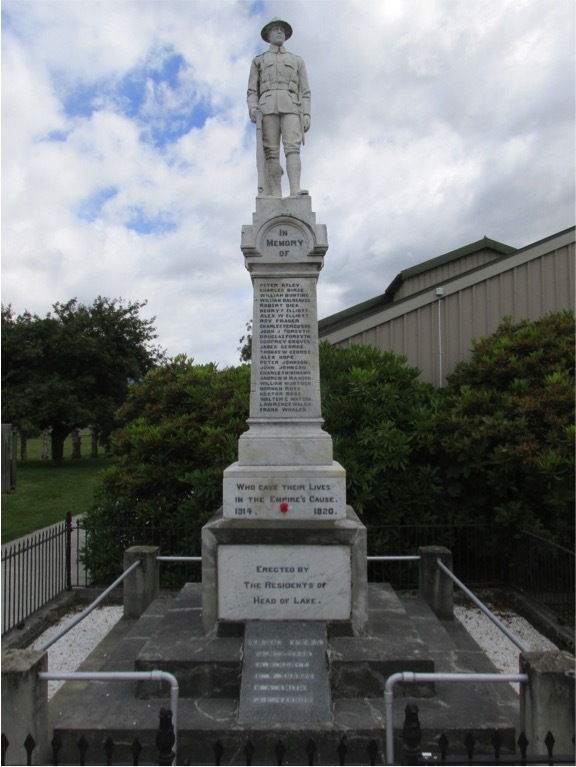 In the village of Glenorchy near Queenstown on South Island we saw the local War Memorial. 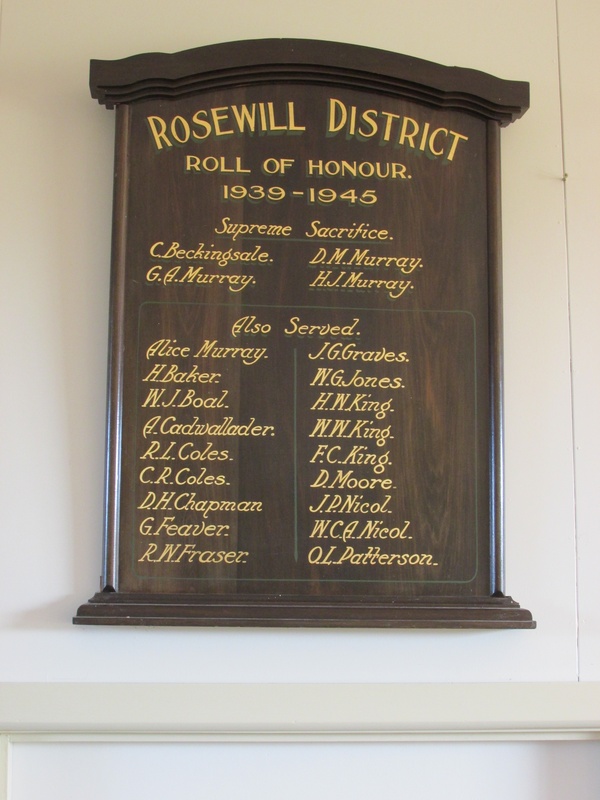 Beside it was a noticeboard which helped to put details of the service of the men remembered on the Memorial. 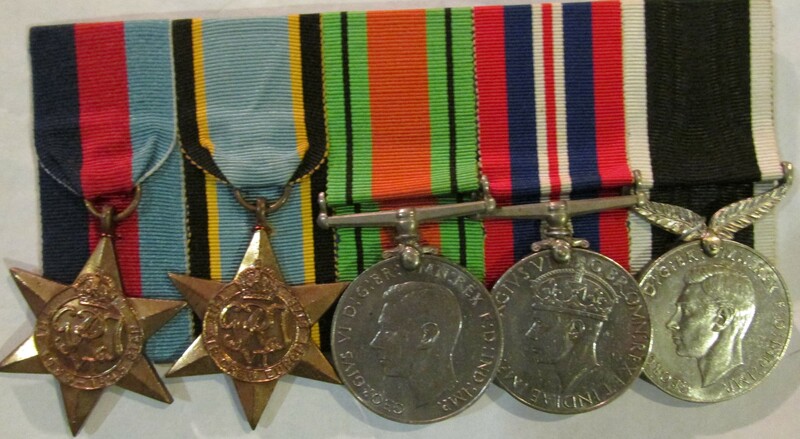 Listed was Alistair Henry Scott 75 (NZ) Squadron. As I was reading the detail, a lady approached and introduced herself to me as his niece, Adrienne Reid. She lives on the east coast of South Island and was visiting Glenorchy that day. It was a remarkable chance meeting with a member of the wider 75 family! She told me that Alistair had a cousin piloting the Lancaster. Sadly all the crew were lost on the 4th November 1944 on the daylight Solingem raid and are buried in Rheinberg War Cemetery in Germany. John McFarland, Navigator – Murray crew. 1944. here. Letters from behind the wire – John McFarland, here. This entry was posted in general and tagged 1944, 75(NZ) Squadron RAF, Aviation, Bomber Command, Douglas John Hill, Dulag Luft, f. holt, Gordon James Irwin, Henry James Murray, Hyman Kahler, John Edward Lithgow McFarland, John Mulligan, Kiel Bay 18th April 1944, Lyndon Oliver Sims, Mepal, Peter Woolam, PoW letter, Roy Max, Sagen, Schräge Musik, Sgt. Taylor FE, Stalag Luft III, World War 2 on February 23, 2015 by 75nzsquadron. Many thanks to David for passing on these photographs of the gravestones of the Murray crew who were killed on the 17th of April 1944. The photographs were taken on a visit to the Churchyard to commemorate the loss of the crew in April this year. 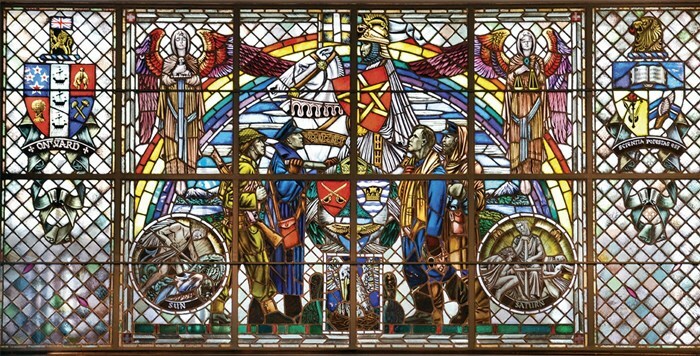 On the 17th of April 1944 at approximately 20 minutes to nine in the evening 7 Stirling Bombers began to leave Mepal to join a total force of 168 aircraft for a large scale Gardening Op to Swinemünde, Kiel Bay,and to the Danish coast. 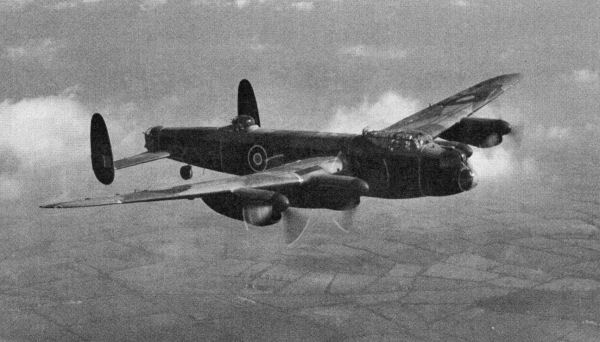 Stirling Mk III EH955 AA-K was shot down by a night-fighter over Denmark on the return flight to base at 14,000ft. The Navigator, John McFarland recalls his navigators desk ‘exploding in front of him’ as the cannon shells, very possibly from a Schräge Musik equipped Nacht Jagd ripped through the aircraft. EH955 crashed at Jenning, about a mile south of Gram. 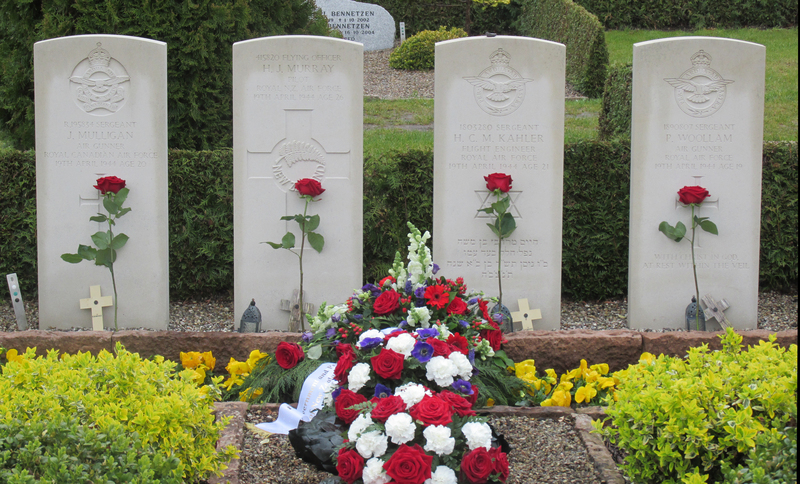 The Captain, Henry Murray, Flight Engineer, Hyman Kahler, Mid Upper Gunner, John Mulligan and Peter Woolam, the Rear Gunner were killed and buried at Gram. Tragically, the crew volunteered for this Op, believing that having just converted to Lancasters, a Gardening Op in a Stirling would be an easy extra Op for their tour. 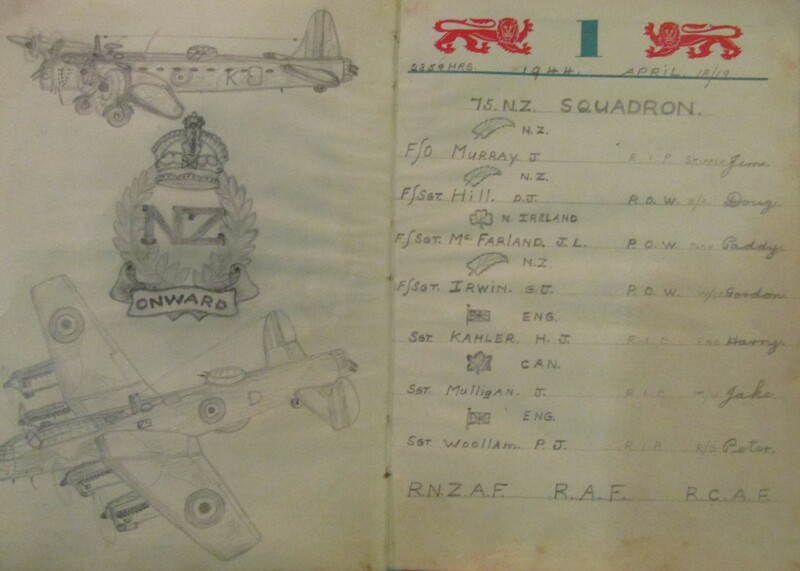 F/O Henry James Murray RNZAF NZ415820. Pilot. Age 26. Sgt. Hyman Chaim Mordecai Kahler RAFVR1803280. Flight Engineer. Age 21. Sgt. John Mulligan RCAF R.195834. Mid Upper Gunner. Age 20. Sgt. Peter Woolam RAFVR 1890807. Rear Gunner. Age 19. The crew’s Navigator, Air bomber and Wireless Operator all succeeded in baling out and were captured as Prisoners of War. Sgt. John Edward Lithgow McFarland RAFVR 1503993. Navigator. Prisoner of War No. 4193. Prisoner of War Camps – Dulag Luft, Stalag Luft III. Promoted to F/Sgt while a Prisoner of War. F/S Douglas John Hill RNZAF NZ415761. Air Bomber. Doug Hill had a miraculous escape when his parachute harness, which was cut by a burst of fire from the night fighter, came off. His left foot caught in the harness and he descended hanging by his foot. Prisoner of War No. 3550. 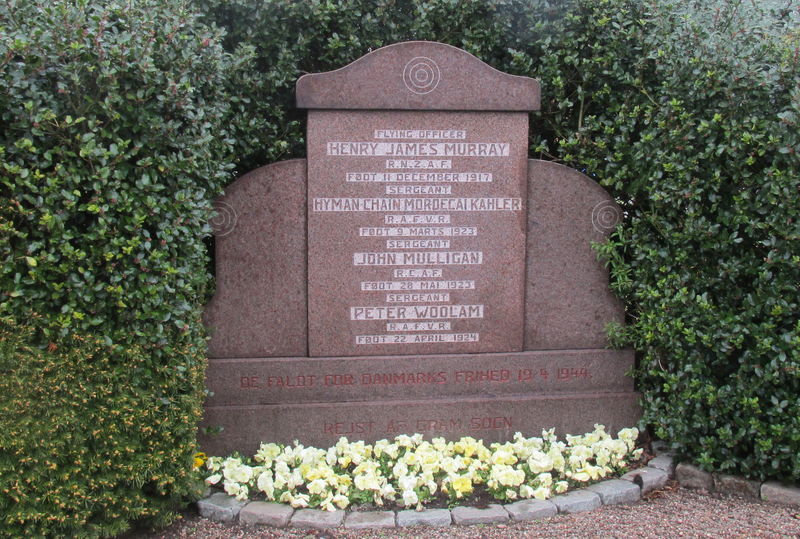 Prisoner of War camps – Dulag Luft, Stalags Luft VI and 357. Returned to the United Kingdom 6th May 1945. F/S Gordon James Irwin RNZAF NZ415698. Wireless Operator. Wounded when attacked by night fighter. Prisoner of War camps Dulag Luft, Stalag Luft III. Promoted to W/O while a Prisoner of War. Returned to the United Kingdom 14th May 1945. This entry was posted in general and tagged 1944, 75(NZ) Squadron RAF, Aviation, Bomber Command, Douglas John Hill, Gordon James Irwin, Gram Churchyard Denmark, Henry James Murray, Hyman Kahler, John Edward Lithgow McFarland, John Mulligan, Kiel Bay 18th April 1944, Mepal, Peter Woolam, Roy Max, Schräge Musik, Sgt. Taylor FE, Stirling Mk.III EH955 AA-K, World War 2 on August 14, 2014 by 75nzsquadron. 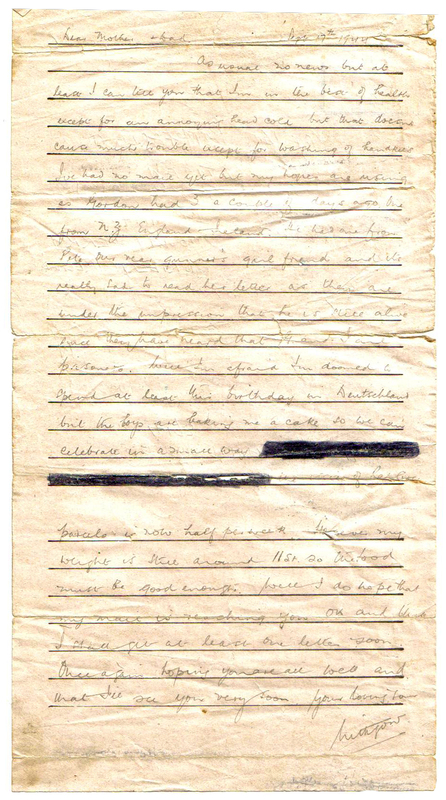 By John’s own observation the decision to volunteer for the Gardening Op to Kiel on the 18th April 1943, in a Stirling was seen as a soft and easy extra trip to their tour…..Perhaps this decision can be understood – the crew had suffered 3 aborted Ops in a month and it probably felt to them as if their time at Mepal was never going to end – add to this a 10 day hiatus for conversion to Lancasters at Feltwell and the soles of their feet may well have been getting itchy……. Based on the events of that night, it would appear that their aircraft was fired on from underneath by a ‘Schräge Musik‘ equipped aircraft. Typically, the aircrew would get no warning of the attack until it was too late – John recalls his navigators desk exploding as the cannon shells hit. Of the 7 crew, John, Gordon Irwin the Wireless Operator and Doug Hill, the Air Bomber survived. 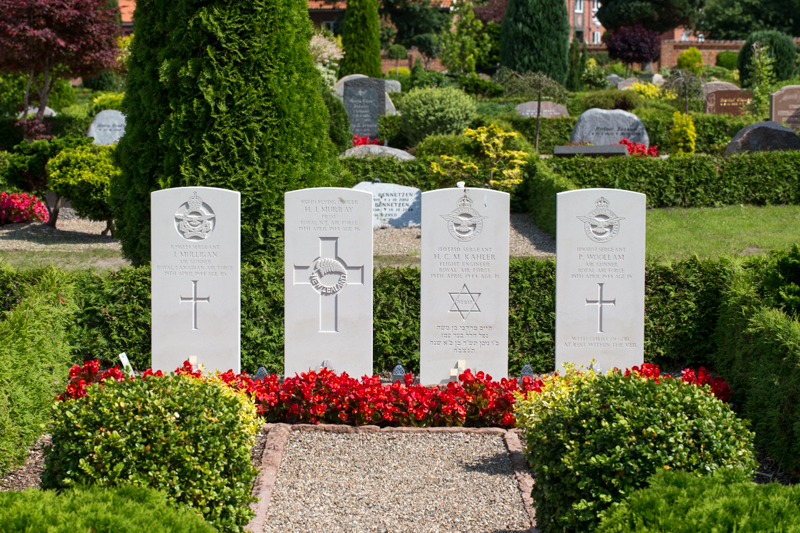 The rest of the crew, Pilot, Henry James Murray, Flight Engineer, Hyman Chaim Mordecai Kahler, Mid Upper Gunner John Mulligan and Peter Woolam, the Rear Gunner all perished and now lay together in Gram Churchyard in Denmark. 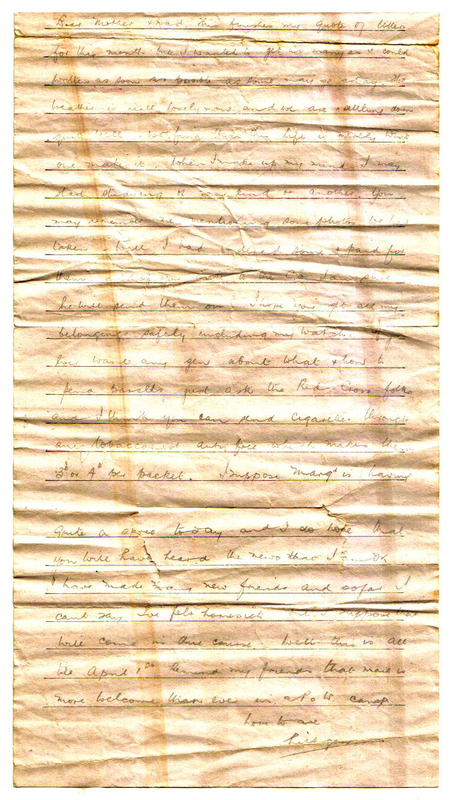 David along with the letters supplied a brief explanation as to some aspects of the content and also, interestingly, notes that it would appear that the positions of the gunners may well have been reversed that night. “Understandably the content is rather mundane, but they are fascinating records which may be of interest to you as unofficial archivist! (Lithgow was my father’s third christian name and the one that was used by his family, although he would have used John – and ‘Paddy’ of course would be used by his crew.) The reference to Margt is my aunt Margaret – I think the 11th May was her birthday, and Gordon, is the New Zealander – Gordon Irwin the wireless operator, who was also in Stalag Luft III. 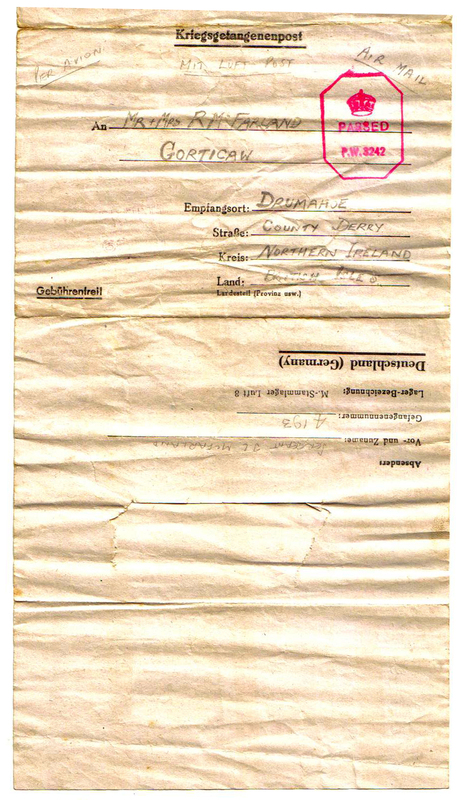 His father came from Northern Ireland, hence the reference to a letter from Ireland. 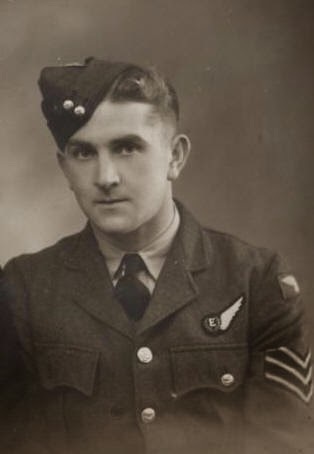 Peter Woollam, rear gunner, died on the 19th when his parachute failed to open, although strangely Jack Mulligan’s body was found in the tail section so he may well have been the Rear Gunner that op, with Peter Woollam Mid Upper Gunner. Dad’s birthday is 22nd September. I smiled at the April Fool joke! “Dear Mother & Dad. This finishes my quota of letters for this month but I wanted to get as many as I could write as soon as possible as some may go astray. The weather is really lovely now and we are settling down quite well. We find that this life is really what one makes it. When I make up my mind I may start studying of some kind or another. You may remember me mentioning some photos we had taken. Well I had ordered some and paid for them and if you write to the C.O. I am sure that he will send them on. I hope you get all my belongings safely including my watch. If you ever want any gen about what & how to send parcels just ask the Red Cross folks and I think you can send cigarettes through any tobaccanist duty free which makes them 3d or 4d per packet. I suppose Margt is having quite a spree today and I do hope that you will have heard the news that I am OK. I have made many new friends and so far I can’t say I’ve felt homesick, but I suppose that will come in due course. Well this is all like April 1st. Remind my friends that mail is more welcome than ever in a P.O.W. camp. “Dear Mother & Dad. As usual no news but at least I can tell you that I am in the best of health except for an annoying head cold but that doesn’t cause much trouble except for washing of hankies. I’ve had no mail yet but my hopes are rising as Gordon had 3 a couple of days ago, one from NZ, England & Ireland. 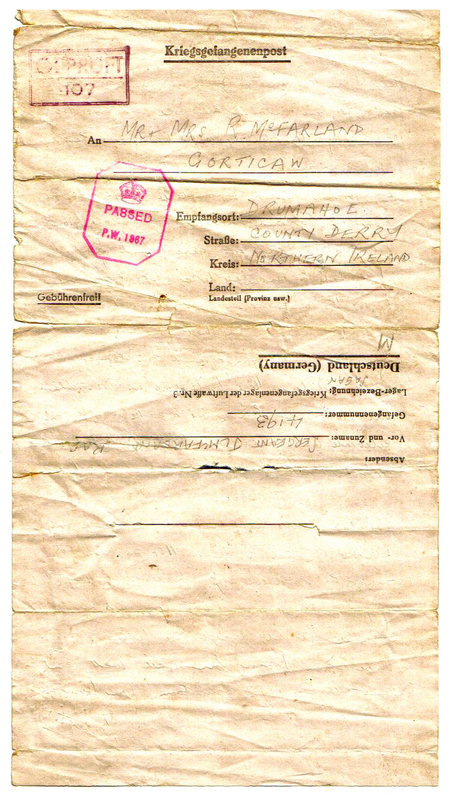 He had one from Pete our rear gunner’s girlfriend and it’s really sad to read her letter as they are under the impression that he is still alive since they have heard that G and I are prisoners. Well I am afraid that I am doomed to spend at least this birthday in Deutschland but the boys are baking me a cake so we can celebrate in a small way. (CENSORED) the issue of Red Cross parcels is now half per week. However my weight is still around 11st so the food must be good enough. Well I do hope that my mail is reaching you OK and I shall get at least one letter soon. Once again hoping you are all well and that I’ll see you very soon. Tomorrow, 2 letters written at home…………. To read an earlier post about the Murray crew, click here. 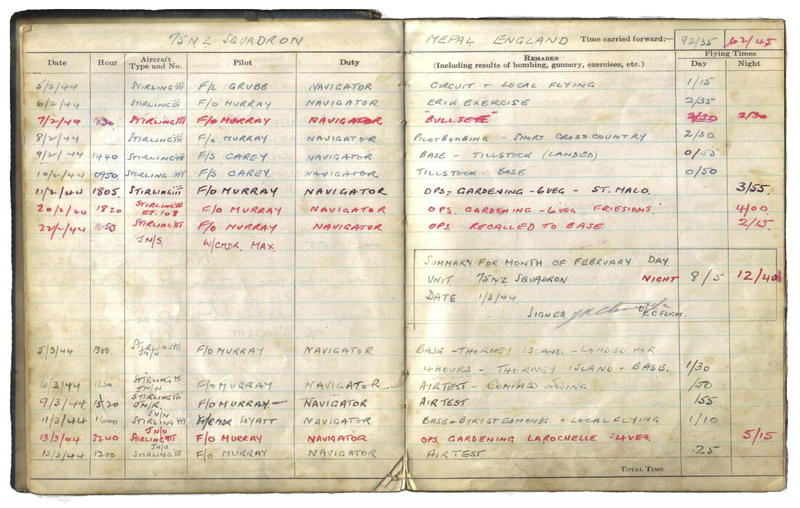 To read John’s logbook, click here. To read about John and his families trip to Gram (including an article by Danish TV), click here. This entry was posted in general and tagged 1944, 75(NZ) Squadron RAF, Aviation, Bomber Command, Douglas John Hill, Dulag Luft, f. holt, Gordon James Irwin, Henry James Murray, Hyman Kahler, John Edward Lithgow McFarland, John Mulligan, Kiel Bay 18th April 1944, Lyndon Oliver Sims, Mepal, Peter Woolam, PoW letter, Roy Max, Sagen, Schräge Musik, Sgt. Taylor FE, Stalag Luft III, World War 2 on July 23, 2014 by 75nzsquadron. Many thanks to David for passing on a clip from Danish TV that shows a visit to Gram Churchyard by his Father John McFarland, Navigator with the Murray crew, who were shot down on the 18th of April 1944, whilst on a Gardening Op over Kiel Bay. John and the family went to pay their respects at Gram Cemetery to the 4 members of the crew who did not survive. 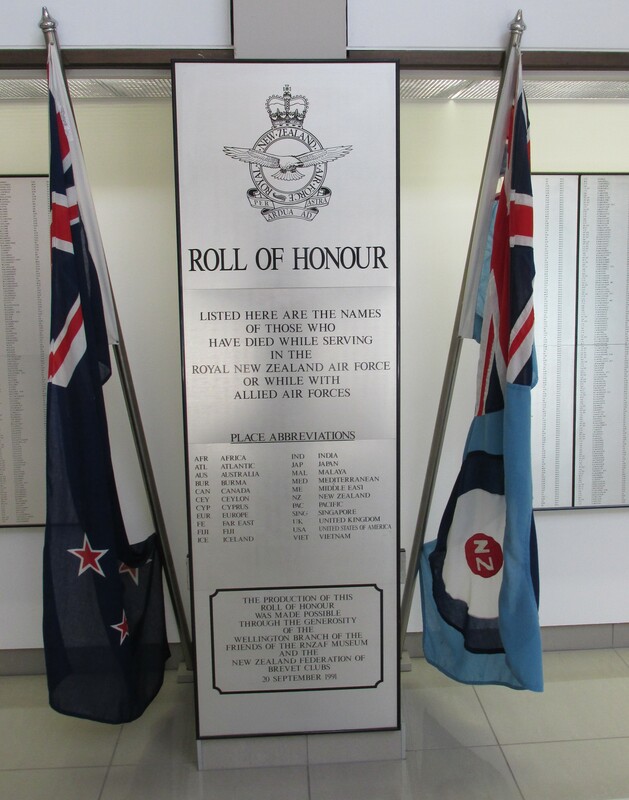 F/O Henry James Murray RNZAF NZ415820. Pilot. PoW No. 4193. PoW Camps – Dulag Luft, Stalag Luft III. Promoted to F/Sgt while a PoW. PoW No. 3550. PoW camps – Dulag Luft, Stalags Luft VI and 357. Safe UK 6 May 1945. Wounded when attacked by night fighter. PoW camps Dulag Luft, Stalag Luft III. Promoted to W/O while a PoW. Safe UK 14 May 1945. Sgt. Hyman Chaim Mordecai Kahler RAFVR1803280. Flight Engineer. Sgt. John Mulligan RCAF R.195834. Mid Upper Gunner. Sgt. Peter Woolam RAFVR 1890807. Rear Gunner. Click here to see the TV clip – it’s obviously in Danish, but you can understand the sentiment and luckily, John doesn’t speak Danish! This entry was posted in general and tagged 1944, 75(NZ) Squadron RAF, Aviation, Bomber Command, Douglas John Hill, f. holt, Gordon James Irwin, Henry James Murray, Hyman Kahler, John Edward Lithgow McFarland, John Mulligan, Kiel Bay 18th April 1944, Lyndon Oliver Sims, Mepal, Peter Woolam, Roy Max, Schräge Musik, Sgt. Taylor FE, World War 2 on April 26, 2014 by 75nzsquadron. Many thanks again to John and David for passing on the full (colour) version of John’s logbook. Browsing the internet, I cam across Johns recollections on the ‘Big Lottery Fund’ website of all places. John had been successful in an application to get over to the UK for a Squadron Association reunion. “John’s story began when he came to Belfast in 1940 to sit a Latin exam for a pharmacist’s apprenticeship he’d secured in Derry. “I’d always found the Latin a chore and a friend had told me about the great time he was having in the RAF so when I was in Belfast I went to the RAF recruiting office and joined up,” he said. In June 1941 John was formally called up and began training as a navigator. After graduating, he should have gone to an Operational Training Unit where the air crews were put together, though they were infamous for their 20% loss of life. “But then word came through that I was to by-pass this, I never knew why, and join a crew before going onto the 75th New Zealand Squadron as a replacement navigator – and you never asked who you were replacing,” said John. He continued: “We flew from a remote base near Ely in East Anglia and were engaged mainly in sea and French railway yard mining operations as well as drops to the French Resistance. It was during one of these we were shot down. The Germans had the capability to fire vertically upwards. We were over Denmark and it was around midnight when my navigator’s table shattered and I knew we’d been hit from below. Despite his stoicism in recounting the story, the tragic irony of that loss of life still sits heavily on John McFarland’s heart. “Back in the UK we were de-loused, de-briefed and told we could go home – so home it was,” he said. “That’s when I understood what it must’ve been like for our families. Our Commanding Officer, a wonderful man, had sent a personal letter to them when our plane hadn’t come back that night…”. 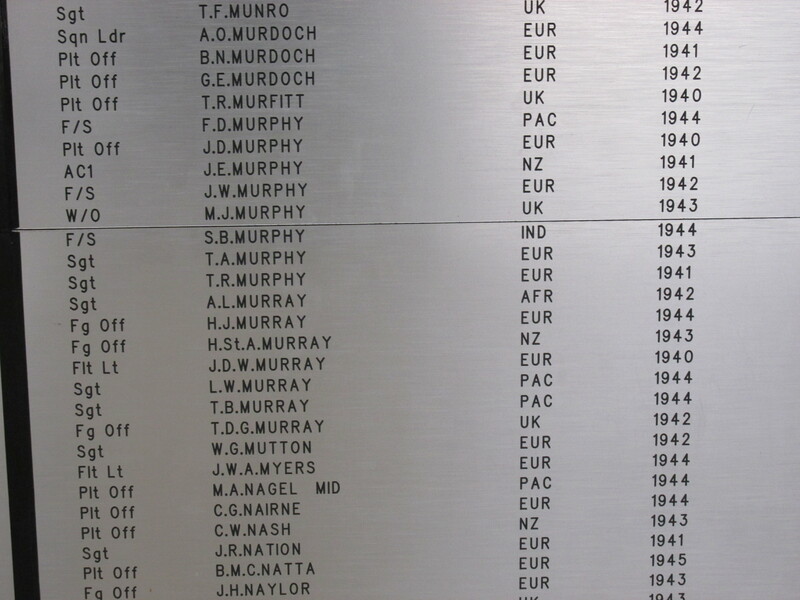 This entry was posted in general and tagged 1944, 75(NZ) Squadron RAF, Aviation, Bomber Command, Douglas John Hill, f. holt, Gordon James Irwin, Henry James Murray, Hyman Kahler, John Edward Lithgow McFarland, John Mulligan, Kiel Bay 18th April 1944, Lyndon Oliver Sims, Mepal, Peter Woolam, Roy Max, Schräge Musik, Sgt. 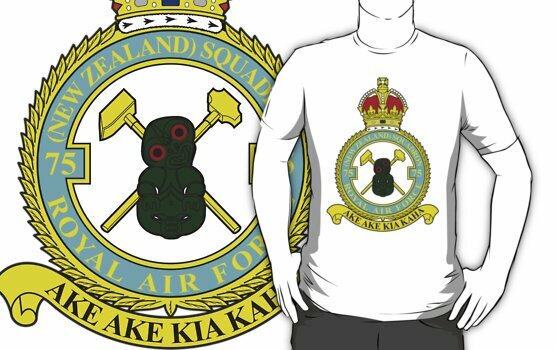 Taylor FE, World War 2 on September 14, 2013 by 75nzsquadron. Sgt. John McFarland receiving his Navigators badge at the end of training in Canada. 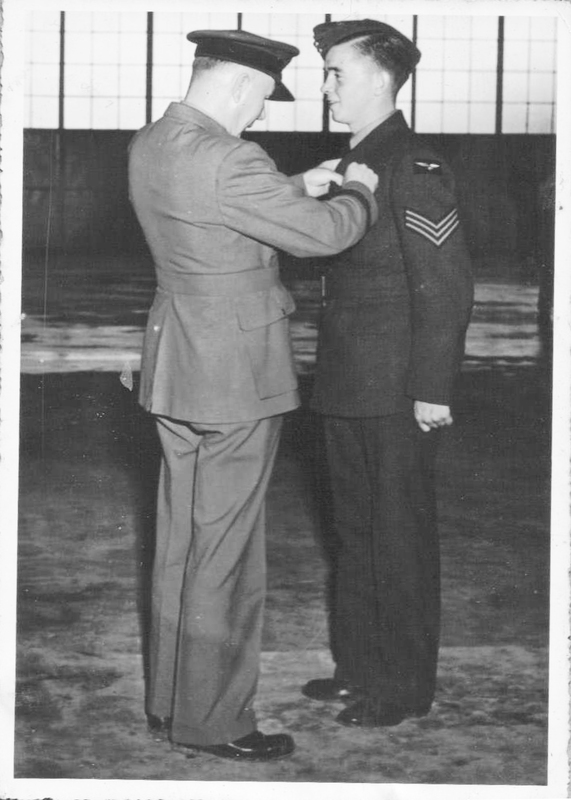 Many thanks to John McFarland, his son David and his daughter Emily for contacting me and passing on this wonderful photograph of John receiving his ‘Air Observer’s Wings’ (David assures me this is Canadian for Navigator!). I had the pleasure of meeting John last November at the ‘Friends of 75(NZ) Squadron Association’ winter reunion – taking the chance to ask him to sign my copy of ‘Forever Strong’ the Squadron history – something he was happy to do. I am happy to report that John is still in good health and I hope to see him and possibly some of the family at the next winter reunion this November. 11.2.44. Gardening – Mining in St. Malo Bay. F/O Henry James Murray – Pilot. Sgt. John Edward Lithgow McFarland – Navigator. F/S Douglas John Hill – Air Bomber. F/L Lyndon Oliver Sims – Flight Engineer. Sgt. John Mulligan – Mid Upper Gunner. Sgt. Peter Woolam – Rear Gunner. Sgt. Hyman Kahler replaces Lyndom Sims as Flight Engineer. W/C Roy Max as 2nd Pilot. Prop broke on take-off – jettisoned mines and made 3 engined landing. 25.3.44. War Ops – Attack Against Special Target. Sgt. Taylor in for Kahler as Flight Engineer. The following proceeded for Lancaster conversion to No.£ L.F.S. Feltwell:- NZ415820 F/O H. Murray and crew, NZ42354 F/S Armstrong C. and crew, NZ414591 A/F/L S. Clark and crew, NZ403561 A/S/L J. Climie and crew, 151118 A/F/L D. Warren and crew, NZ422282 F/O R. Herron and crew, NZ401266 A/S/L D. Gibb and crew, AUS413157 P/O A. Humphreys and crew, and NZ421105 Sgt. Scott F. and crew. The following crews ceased to be detached to No. 3 L.F.S. Feltwell:- NZ415820 F/O H. Murray and crew, NZ42354 F/S Armstrong C. and crew, NZ414591 A/F/L S. Clark and crew, NZ403561 A/S/L J. Climie and crew, 151118 A/F/L D. Warren and crew, NZ422282 F/O R. Herron and crew, NZ401266 A/S/L D. Gibb and crew, AUS413157 P/O A. Humphreys and crew, and NZ421105 Sgt. Scott F. and crew. 9.4.44. War Ops – Attack Against Villeneuve St. George. Sgt. F. Holt in for Taylor as Flight Engineer. Hyman Kahler returns as Flight Engineer. Missing – Shot down by a night fighter. Sgt. Hyman Chaim Mordecai Kahler RAFVR 1803280. Flight Engineer. 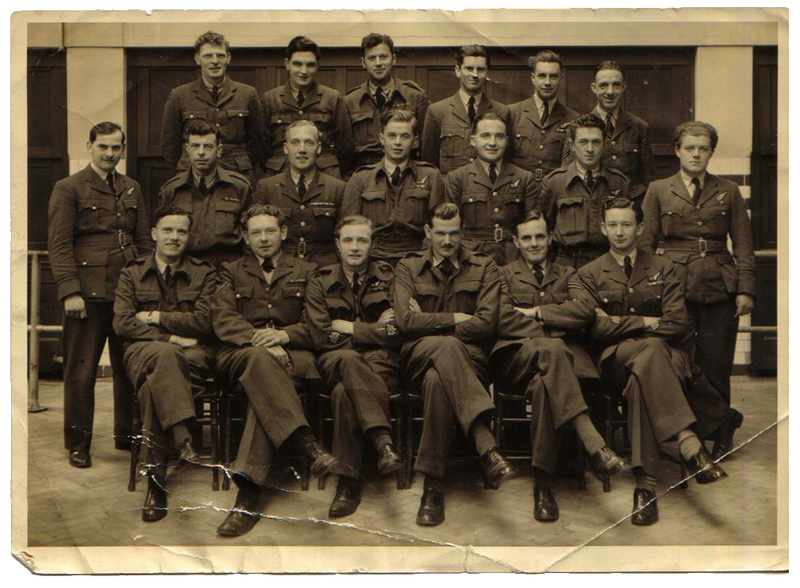 By John’s own observation the decision to volunteer for the Gardening Op to Kiel in a Stirling was seen as a soft and easy extra trip to their tour…..Perhaps this decision can be understood – the crew had suffered 3 aborted Ops in a month and it probably felt to them as if their time at Mepal was never going to end – add to this a 10 day hiatus for conversion to Lancasters at Feltwell and the soles of their feet may well have been getting itchy…….